I wanted to start reading “The Tale of Genji”, but found that my favored translation from Edward Seidensticker is not available as Kindle compatible Ebook. The University of Adelaide Library, however, has released the text for free as a website. Thanks to their work, particularly that of Stephen Thomas, who rendered the text as HTML, I was able to convert the book to the Mobi format which can be read by Kindle. 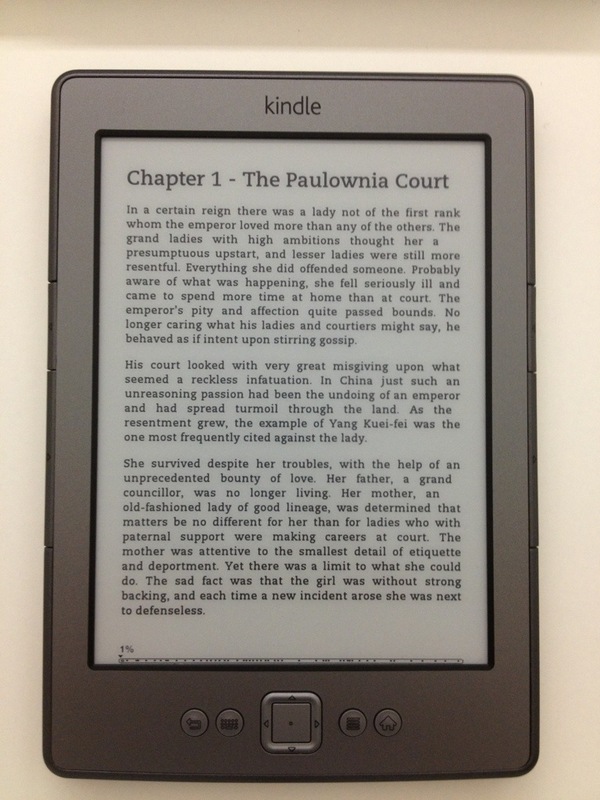 Mobi is an open format, so you should be able to convert it to most other ebook reader formats, for example using a tool like Calibre. Please consider the licence mentioned in the ebook if you do. Download of The Tale of Genji here, there is also a Github repository if there are changes to be made. The Tale of Genji (源氏物語 Genji Monogatari?) is a classic work of Japanese literature written by the Japanese noblewoman and lady-in-waiting Murasaki Shikibu in the early years of the 11th century, around the peak of the Heian period. It is sometimes called the world’s first novel, the first modern novel, the first psychological novel or the first novel still to be considered a classic. Notably, the novel also illustrates a unique depiction of the livelihoods of high courtiers during the Heian period. While universally considered a masterpiece, its precise classification and influence in both Western and Eastern canon has been a matter of debate.